The Welsh Springer Spaniel dog breed was developed as a gundog to flush, or spring, game in the field. A faithful companion, he’s a favorite of discriminating hunters and families. Give him the exercise and training he needs, and he’ll be your best friend. 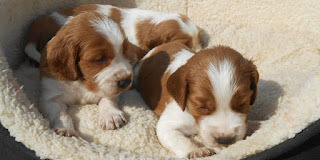 The Welsh springer spaniel is a hunting dog and should be in hard muscular condition. It is in no way a breed of exaggeration. It is very slightly longer than tall, compact and possessing substance without coarseness. Its strides are powerful and ground-covering. The coat is flat and straight, dense enough to protect it from water, weather and thorns but not so excessive as to be a hindrance in the dog's work as a flushing spaniel. The expression is soft. Less exuberant that the English springer, the Welsh springer spaniel is steady and easygoing. It still needs plenty of hard exercise, however, as it loves to hunt for birds. It is extremely devoted to its family, but it is independent in nature. It is reserved with strangers; some may even be timid. Welsh Springer Spaniels are not as outgoing as English Springer Spaniels and may be a bit standoffish with strangers unless they are well socialized. They can suffer from separation anxiety if left alone too much and for too long. If this occurs, they may engage in destructive behavior. 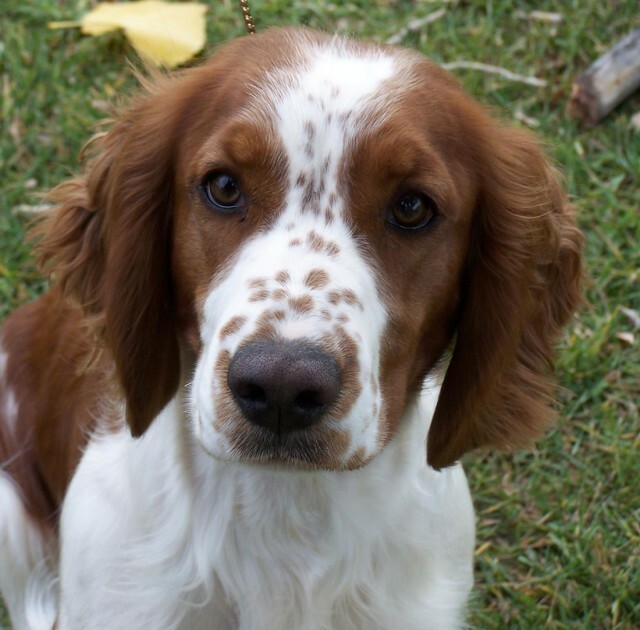 Welsh Springer Spaniels have a "soft" personality and will not respond well to harsh training methods. Especially when they are young, Welsh Springer Spaniels can greet you with a great deal of exuberance, jumping up on you and generally showing their joy at seeing you. You might want to train them not to jump, especially if you have children that they might accidentally knock to the ground. 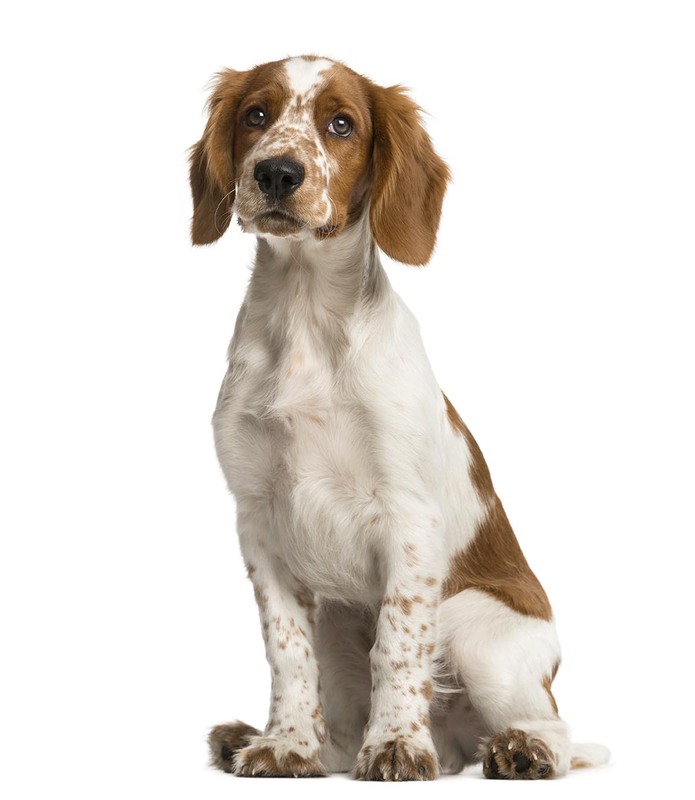 Welsh Springer Spaniels were developed to have great stamina and energy. Be sure you can provide your dog with adequate exercise or he may become nervous and destructive. Be sure to keep your Welsh Springer Spaniel on a leash when you take him to unfenced areas. You never know when he will see a bird or other small animal and be overcome by his instinct to hunt! The Welsh Springer is believed to be one of the oldest of the spaniel breeds. Welshies have a flat, straight coat with thick, silky fur. The coat picks up mud, dirt, and stickers, but sheds them just as easily. Although coat color and size are the primary differences between Welshies and English Springer Spaniels, the Welshie also has shorter ears. Coloration: Rich red and white only. Any pattern is acceptable and any white area may be flecked with red ticking. Little is known about the Welsh Springer’s origins, but he’s considered a very old breed, with ancestors dating to Roman Britain. Tapestries from the Renaissance depict spaniels that closely resemble today’s Welsh Springer; similar red-and-white spaniels appear in a few 18th-century portraits. By the 19th century, the dogs were little known, except in the Neath Valley region of southern Wales. The preponderance of dog shows in the late 19th century brought about renewed interest in the breed, which made an appearance at the first Kennel Club show, held in 1873. They were judged alongside black-and-white spaniels and white English Springer Spaniels. Eventually, the two breeds were separated. The American Kennel Club recognized the Welsh Springer in 1906, but few people were interested in the breed. By the end of World War II, they were practically non-existent in the United States, until 11 of them were imported in 1949. 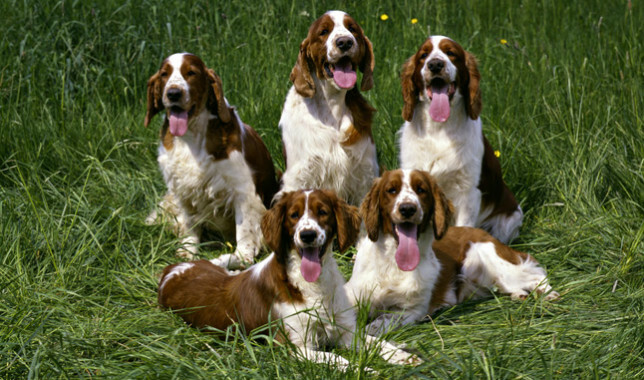 A dozen years later, the Welsh Springer Spaniel Club of America was founded. Today, the Welsh Springer remains a well-kept secret, ranking 127th among the breeds registered by the AKC, down from 113th a decade ago. Welsh Springer Spaniels are less outgoing than their English cousins but still share the same zest for life. They are full of energy and enjoy spending time with people of all ages – even kids and will attach himself deeply to the people he loves. Built for hunting, Welsh Springers still enjoy working in the field, but will also have fun tracking and stalking birds in the backyard. They can be a bit messy, tracking dirt and water throughout the house, but their smiling faces and constantly wagging tails makes staying mad at a Springer nearly impossible. They will alert you that someone is approaching the house, though they are too shy to be effective guard dogs. For active families, Welsh Springer Spaniels make excellent pets. Cataracts, progressive retinal atrophy and glaucoma are common eye problems found in the Welsh Springer Spaniel. 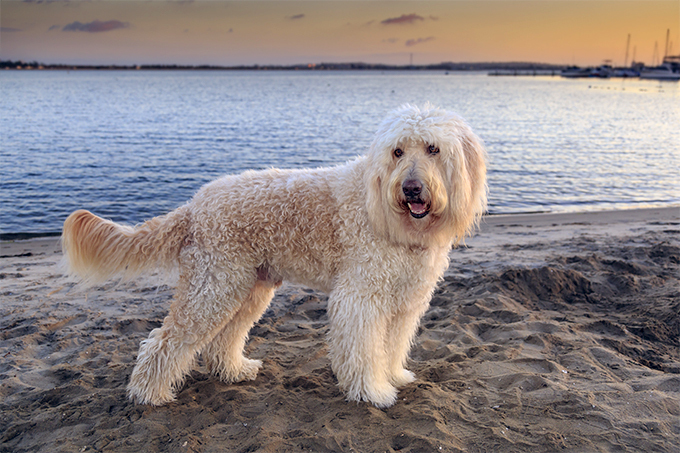 This breed also has a high incidence of epilepsy, which can be controlled with medications. Rarely has the breed had issues with hip dysplasia. Welsh Springer Spaniels can be kept outside, with adequate shelter from the heat and cold, but they are such wonderful family companions, why wouldn't you want them in your house, sleeping at your feet in the evening? Welsh Springer Spaniels are fairly active indoors and can live comfortably in city apartments (with proper exercise, of course) or in the country. They do best with at least an average-size yard in which to run. Wherever they live, they are energetic dogs that need a lot of exercise to keep them from becoming fat, bored, and lazy. Keep training sessions short and positive. That's more suited to their personality and attention span than boring repetition. Train them with understanding and patience, and you'll be well rewarded. The Welsh Springer Spaniel will do okay in an apartment if it is sufficiently exercised. It is fairly active indoors and will do best with at least an average-sized yard. The Welsh Springer's coat keeps the dog comfortable in both hot and cold weather. 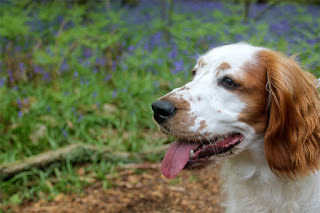 Welsh Springer Spaniels are relatively easy to train, but they can be independent and also carry a touch of doggy ADD which can be frustrating. Keep lots of treats on hand to keep his interest, keep sessions short, and be ready to hand out lots of exuberant praise. Springers do not respond well to harsh discipline – they will shut you out if they start to mistrust you – so it's best to positively reinforce good behavior and ignore the bad. The Welsh Springer Spaniel is an energetic and lively dog that needs plenty of regular exercise, including a daily, long walk. It will greatly enjoy running off the leash in a safe area. Without enough exercise, these dogs will become bored, fat and lazy and are more likely to develop a wide variety of behavior problems. The Welsh Springer Spaniel has a straight, silky coat that should be brushed and combed at least twice a week — and each time he comes back from hunting — to prevent tangles. The best tools for the task: a slicker brush and a stainless steel Greyhound comb. Brush out the feathering on the legs, body, and ears with the slicker brush to remove dead hairs; use the comb on the rest of the body. You should also ask your breeder to show you how to do detailed trimming with clippers and shears to produce a neat look. The Welsh Springer Spaniel Club of America offers a how-to on grooming your Welshie to perfection. The rest is basic care: Trim the nails as needed, usually every week or two. And keep the ears clean and dry, especially if your Welshie is a swimmer. Brush the teeth frequently with a vet-approved pet toothpaste for good overall health and fresh breath. Welsh Springers are gentle around children if they grow up with them or are exposed to them when they're young. If they're raised with them from puppyhood, they are generally good with other pets in the household, even small ones, although they might see birds as prey since that's what they are bred to hunt. The Welsh Springer’s iconic red-and-white coat isn’t the breed’s only distinctive trait. He also has slightly webbed feet, giving him an advantage when it comes to fetching waterfowl. The Norfolk Terrier is one of the smallest working terriers. While on the hunt, it is a little demon, showing versatility in handling small vermin, bolting a fox, or going to ground. The Norfolk is also very capable of working in a pack. Unlike the Norwich terrier, the Norfolk is slightly longer than it is tall. Like the Norwich, it is a formidable adversary to vermin and fox and can bolt and dispatch its quarry working along or with a pack. It is small, short-legged and compact, with good bone and substance. Its gait is low and driving. Its double coat is weather resistant, with the outer coat consisting of hard, wiry, straight hair about 1½ to 2 inches long, with a longer ruff. It wears a keen, intelligent expression. 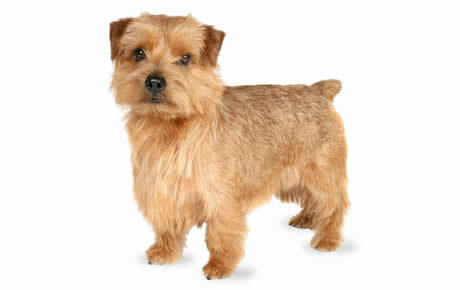 Feisty, bold, inquisitive, game, scrappy, stubborn and independent, the Norfolk is all terrier. It has been called a "demon" in the field, and it loves to hunt, dig and investigate. It must be exercised in a safe area. It is clever and amiable but strong-willed. The Norfolk has a rectangular build, small dark eyes that sparkle with anticipation, small drop ears, a wiry coat, and a docked tail. 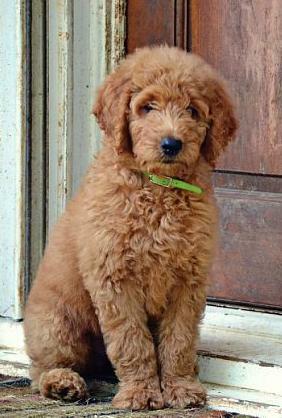 The rough coat of the Norfolk can be any shade of red, wheaten, black and tan, or grizzle . Sometimes a grizzle coat looks bluish gray or iron gray. 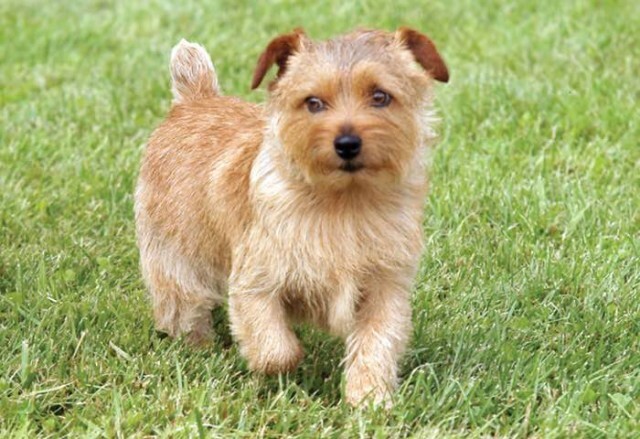 The Norfolk and Norwich Terriers became separate breeds instead of two varieties of the same breed in 1979. One of the reasons there are so many Terrier breeds is because many were custom-created for a particular area or population. The Norwich hails from England’s East Anglia, home of Cambridge University. Like college students of any era, the Cambridge students of the 1880s thought it was good fun to bet on sporting events, including the ratting abilities of their dogs. 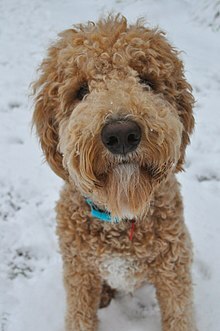 Terriers, including Yorkshire and Irish Terriers, were crossed to develop small red or black and tan dogs with a game spirit. They were known as Trumpington Terriers, and they came in several sizes, colors, coat types, and ear shapes. When a breed standard was eventually written for the dogs, it included both prick-eared and drop-eared varieties. In 1964, England’s Kennel Club separated the two varieties, calling the drop-eared dogs Norfolk Terriers. The American Kennel Club followed suit in 1979. Today the Norfolk ranks 117th among the breeds registered by the AKC. The Norfolk is tireless in his pursuit of fun-which can be exhausting for you. Don't expect the Norfolk to sit around when there's something to investigate. This dog thrives on action so be prepared to provide it for him--or he'll be bored and unhappy. 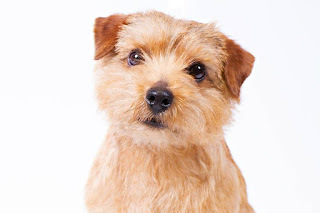 The Norfolk is a typical terrier, meaning he's independent and always ready to give chase. He's prone to dig and bark, too-behaviors that come naturally to breeds bred to chase vermin that live in dens. 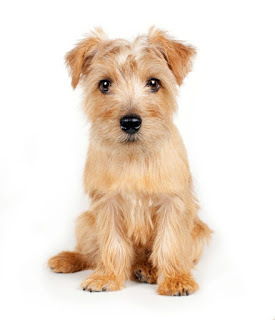 The average life span of the Norfolk Terrier is 12 to 15 years. Breed health concerns may include mitral valve disease, luxating patellas, lens luxation, cataracts and glaucoma. This terrier can live outdoors in warm and temperate climates, but as it is more of a family-oriented dog, it is suited for indoor living. Daily exercise, in the form of a boisterous game session or short leash-led walk, is necessary to keep the dog calm and fit. If you do allow it to remain outdoors, be wary that it does not escape to hunt an animal. The dog’s wire coat requires combing every week, in addition to stripping the dead hair at least three times a year. Norfolks will do okay in an apartment if they are sufficiently exercised. They are fairly active indoors and will do okay without a yard. Even though this is a terrier, Norfolks are easier to train. This is an intelligent dog, so be sure to keep training sessions up-beat and interesting – repetition can bore them. 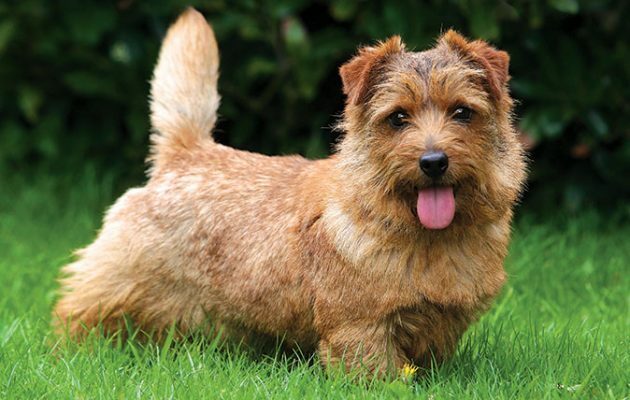 As with most breeds, you need to use positive reinforcement to train the Norfolk Terrier. If you are harsh with this breed, you’ll only get defensive behavior in return. You’ll find that your Norfolk Terrier will fly through basic obedience. At this point, it’s time to move to something more challenging. Consider advanced training, agility or Earthdog activities. All of these activities will keep your dog on his toes. They will be able to exercise their minds and bodies. Earthdog competitions allow these dogs to put their ratting instincts to the test. They hunt and dig for vermin, which are kept out of reach of the dogs. 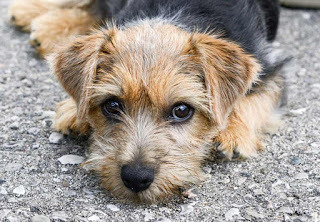 Norfolk Terriers need moderate exercise to maintain health and happiness. Daily walks and some active ball-chasing will meet his activity requirements. The Norfolk's compact size makes them fine apartment dogs, and they are generally easier to handle than other noisy terrier breeds. These little dogs are not couch potatoes. Even indoors they are eager to engage in activity that works both mind and body, so make sure that your Norfolk has lots of toys to keep him occupied, especially when you are gone for the day. If left alone too long with nothing to do, they will occupy themselves by barking, chewing and digging. Norfolks should never be left off leash or in an unfenced area for exercise. They still maintain a strong desire to chase, and will take off like a shot after small animals and they aren't likely to respond to calls home. The Norfolk Terrier has a hard, wiry, straight coat with a heavier amount of hair on the neck and shoulders forming a protective mane. Trimming isn’t necessary, but the coat does need to be hand-stripped twice a year, a time-consuming process of pulling out loose hair with a tool called a stripping knife. In the meantime, brush or comb the coat weekly. If you choose not to strip the coat, the Norfolk will have a scruffy appearance, which some people like. The drawback to this is that the coat will shed more, especially as the dog matures. Stripping the coat has other benefits as well. A stripped coat sheds dirt and is water resistant. Terriers whose coats are stripped need fewer baths. For a neater look, you can have your Norfolk clipped by a professional groomer, but it’s not the perfect solution. 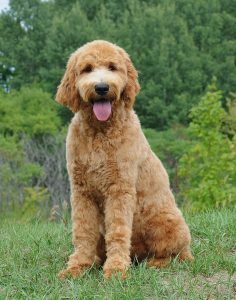 When you cut a Norfolk’s hair, it lightens the color because part of the pigment is removed, and it softens the texture, making the coat less protective. Norfolk Terriers are known to be very good around children of all ages although playtime might get a bit boisterous. As such any interaction between toddlers and a dog should always be well supervised by an adult to make sure playtime does not get too rough and tumble which could end up with someone being knocked over and hurt. When dogs have been well socialised from a young enough age, they generally get on well with other dogs they meet and if they have grown up with a family cat in a household, they usually get on well together. However, a Norfolk Terrier would think nothing of chasing off any other cats they encounter because they would see them as fair game. Care should be taken when they are around any smaller animals and pets because of their high prey drive as such any contact is best avoided. The main differences between the Norfolk and Norwich Terriers are that the Norfolk has drop ears and a slightly longer back. 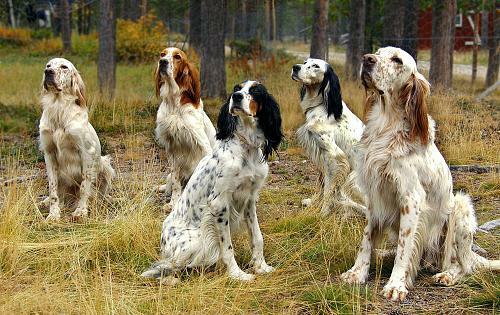 The English Setter, also known as the Lawerack or the Laverack, is a breed of dog in the Sporting Group. This beautiful and graceful breed is known for their agility, intelligence, and athletic feats, but they are also famous for their extremely sweet and gentle temperaments. The English Setter was recognized by the AKC in 1884 and AKC approved in 1986. The English setter is an elegant and athletic hunting dog with the ability to run tirelessly at a good pace. Its trot is ground-covering and effortless, with the head held proudly and a lively tail. The coat is flat, with feathering on the ears, underside, backs of legs, underside of thighs, and tail. Its markings are distinctive, consisting of flecks of color, sometimes with patches, on a white background. The combination of good looks and hunting ability make the English setter a perfect gentleman's hunting companion. The Laveracks tend to be larger, carry more feathering, often have deeper muzzles and usually hold their tails nearly level when on point. The Llewellins tend to be smaller and faster, with less coat and often larger patches of color. They tend to hold their tails straight up when on point. 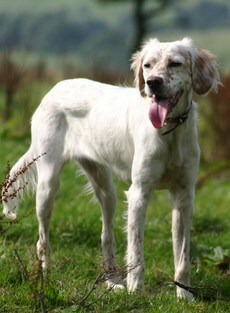 Bred to cover a lot of area when hunting, the English setter is a lively dog that loves to hunt and run. This is especially true of dogs from field lines. If not given sufficient exercise, they can be overly lively inside. With daily exertion, however, they are calm and tractable house dogs. Those from conformation lines are particularly laid-back and gentle and excel with children and less active adults. This is an amiable, easygoing breed that gets along well with children, strangers and other dogs. English Setters can become nuisance barkers, so discourage this habit when they are young. English Setters gain weight easily, so measure their food and cut back some if they appear to be getting pudgy. A fenced yard is essential; English Setters can't be trusted to stay in a yard without fencing. English Setters have great digging and jumping abilities, make sure they have a secure fence. They can be difficult to potty train, so start early and be consistent. 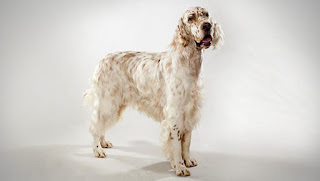 The English Setter’s coat is white with intermingling darker hairs, a pattern known as belton. The coat can be blue belton (black and white), tricolor (blue belton with tan patches), orange belton (orange and white), lemon belton (lemon and white), and liver belton (liver and white). Lemon and liver are not often seen. Some English Setters have a tendency to drool, especially if they’re watching you eat or waiting for a treat. 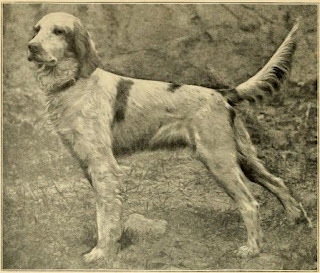 Setters as a type of hunting dog were known in England as long as 400 years ago. They were probably a cross of several types of hunting dogs, including pointers and spaniels. The modern English Setter was developed in the 19th century by Englishman Edward Laverack and Welshman R.L. Purcell Llewellin. Laverack purchased his first two dogs, Ponto and Old Moll, from Rev. A. Harrison in 1825, and they became the foundation of the breed. Laverack concentrated on developing a Setter that was gentle and companionable. He probably added Pointer and Irish Setter to his lines and produced dogs that did well in the show ring but poorly in field trials. Llewellin started with Laverack-type dogs but worked to improve their performance in the field. He crossed them with Gordon Setters and other breeds to improve their scenting ability and speed. 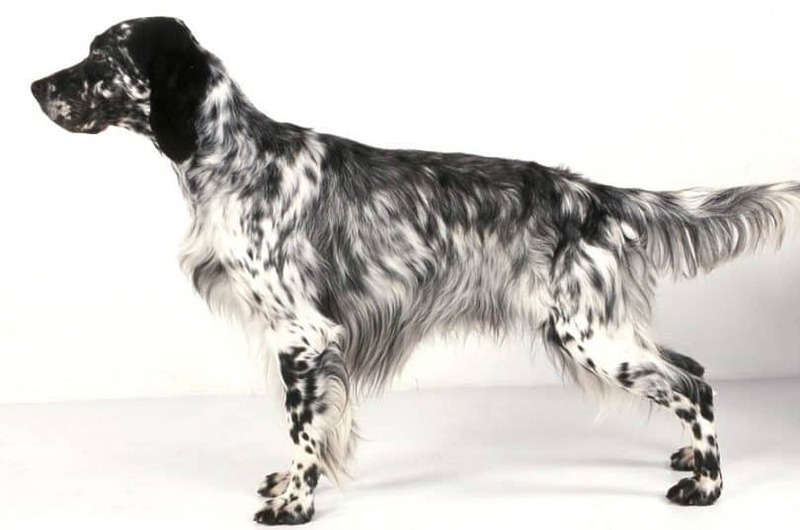 Both types of English Setters came to America in the late 1800s. Laverack's line became the foundation for the show setters of today and Llewellin's line for the field dogs. Setters today have a unique appearance, with their sculpted heads, athletic bodies, and long feathery tails. The show dogs tend to be a bit larger than the field dogs. They have a more luxurious coat and differ slightly in coat pattern. 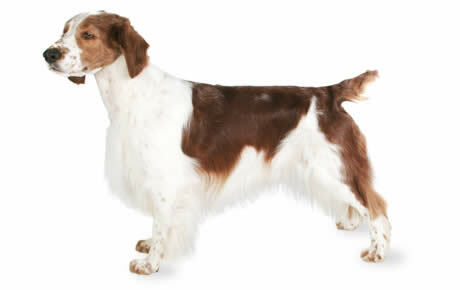 Patches of color are often seen in field English Setters, but they aren't desirable for show dogs. Of course, they don't make a bit of difference if your English Setter is a family companion. The show dogs are capable of hunting, but the field dogs tend to have a keener nose and greater speed. English Setters are rare, ranking 98th among the breeds registered by the American Kennel Club, so if you'd like to share your life with one of these happy, lively dogs, be prepared to spend some time on a waiting list before a puppy is available. The English Setter is a true family dog. Mild-mannered and sweet, the English Setter loves people of all ages and can be trusted around children. They have a knack for remembering things and people, often greeting someone they haven't seen in a long time as if they were old friends. 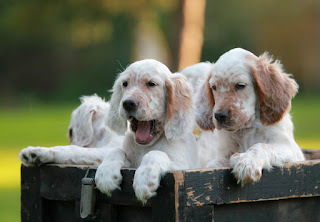 English Setters are sociable creatures who crave the company of humans. They will want to be included in all family activities, are small enough to travel well in the car, and athletic enough to keep up on jogs and hikes. 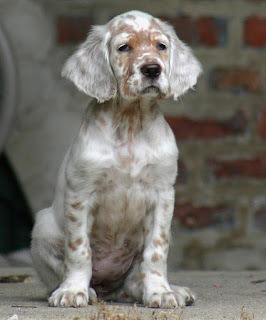 English Setters love all people and are far too laid back to be a reliable guard dog. 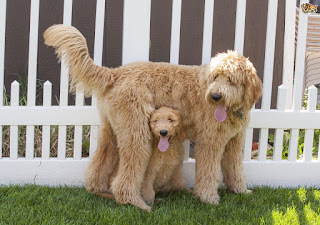 A relatively healthy dog that is simply prone to a few problems relating to large dogs – such as hip dysplasia – this dog doesn’t really suffer from many genetic or hereditary diseases. The English Setter should be kept inside with access to the outdoors. To rid its coat of dead hair, comb it once every two or three days. Its daily exercise routine should be about one hour in length. Not recommended for apartment living and does best with at least an average-sized yard. 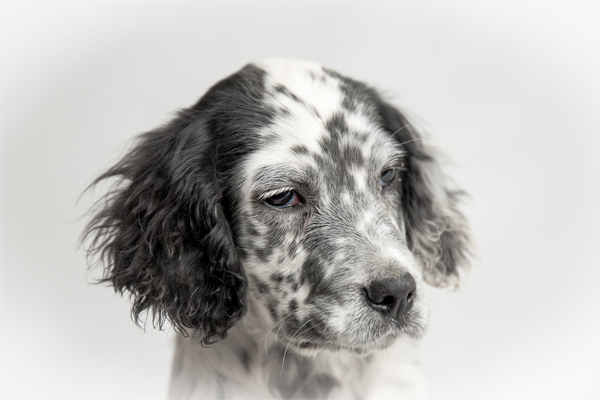 English Setters may love people, but they are more stubborn than you might think. The desire to please isn't strong in them. They are actually quite manipulative, and consistency is key to raising an obedient Setter. A gentle hand is also important when training, as they are sensitive dogs with long memories. They will not forget someone who treats them poorly. Their long memory also means that it can be hard to break English Setters of bad behavior, so early training is very important to keep bad habits from becoming permanent. With plenty to do and a task at hand, the English Setter is at home. You can walk them, but you might find that this isn’t enough – they make excellent play companions who love to get out in the open. The English Setter has a long coat with feathering on the ears, chest, belly, back of the legs, and tail. 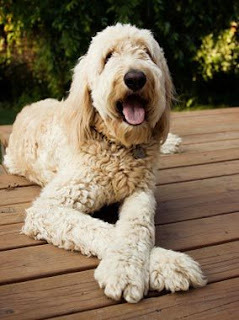 Plan on combing it out at least a couple of times a week or any time your dog has been in the field to remove tangles. A bath every two to three weeks will keep him clean. Unless you show your dog, you can always trim his coat for easier upkeep. English Setters shed moderately, but regular brushing will help keep loose hair from floating onto your floor, furniture, and clothing. It's often more common to need to protect an adult English Setter from children than the other way around. He's tolerant and mellow and will put up with a lot — although he shouldn't have to! Because puppies and toddlers are both in the process of being civilized, they need close supervision to prevent any ear pulling or tail tugging on the part of either party. Many breeders prefer to sell puppies to homes where children are at least six years old and more able to control their actions. They recommend adult English Setters for homes with younger children. Whatever your situation, always teach your child never to approach any dog while he's eating or to try to take the dog's food away. No dog should ever be left unsupervised with a child. English Setters can do well with other dogs and animals, especially if they are raised with them. They are birdy, however, and you should protect pet birds until you're sure your Setter understands they're off limits. Some dogs can learn that fact, if they're taught from puppyhood, but don't assume that it will happen with every dog. You may always need to keep the two separated, if only so your Setter doesn't pull your parakeet's tail or your parrot take a bite out of your Setter's sensitive nose. Moderate Maintenance: Regular grooming is required to keep its fur in good shape. Professional trimming or stripping needed. Moderately Easy Training: The English Setter is average when it comes to training. Results will come gradually. The English Setter is smaller than the Irish Setter and the Gordon Setter. 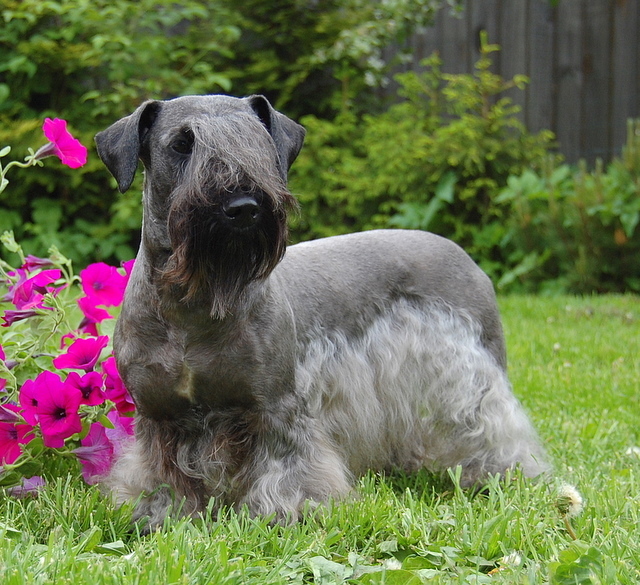 The Cesky (pronounced Chess-key) Terrier, or Bohemian Terrier is a relatively new breed of terrier created by the Czech geneticist Frantisik Horak in 1948. 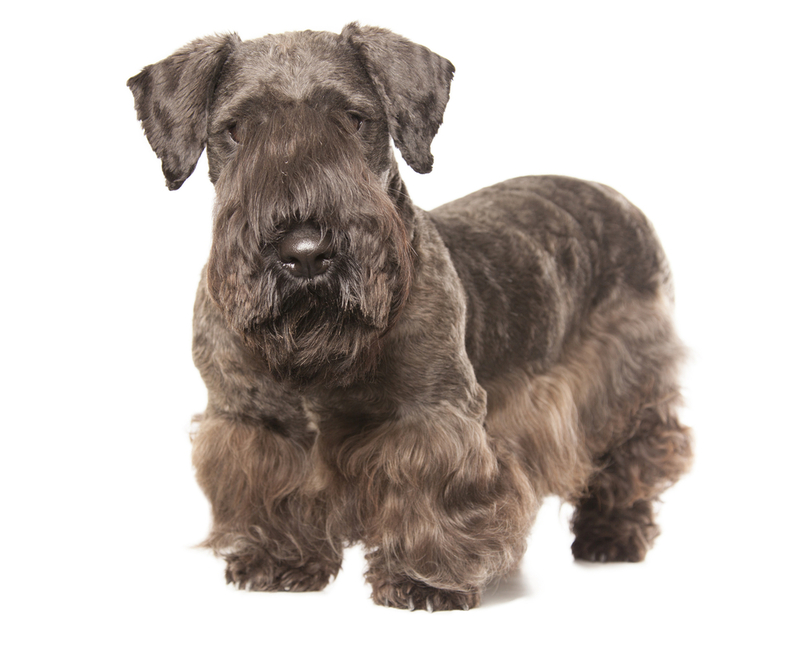 Bred to hunt in packs, the Cesky Terrier is a short-legged and well-muscled dog. Its head is wedge shaped and its high-set, triangular shaped ears fold forward onto its head. 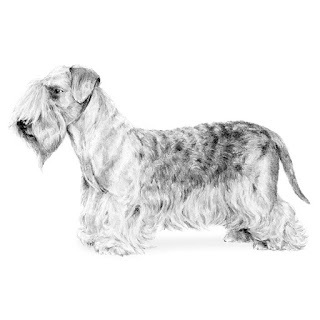 The Cesky’s coat is distinctively long and silky and its face sports a bushy beard, moustache and eyebrows. The result of a cross between a Scottish Terrier and a Sealyham Terrier — with the goal of creating a dog that could go after vermin without getting stuck in their dens — the Cesky was created in 1948 in what was then Czechoslovakia. Loving and devoted, he's also active enough to compete in earthdog trials, agility, obedience, and tracking. The Cesky is also a successful therapy dog. He gets along well with children and other pets, especially if he's raised with them. The Cesky was introduced in the wake of World War II, making him one of the newest breeds to attain recognition by the American Kennel Club. The Cesky is a terror when it comes to toys. He can destroy them in no time flat. Supervise play or resign yourself to frequently purchasing replacements. The Cesky Terrier was created by a Czech breeder, František Horák, in 1948, as a cross between a Sealyham Terrier and a Scottish Terrier, to create a terrier suitable for hunting in the forests of Bohemia. Although not a trained scientist, Horák worked for many years as a research assistant at the Czechoslovak Academy of Sciences and used knowledge gained there in his dog breeding. Czechoslovakia was ruled by a communist regime at the time; when Horák's dogs became more popular around the world, he began to receive a large volume of mail from outside the country, which earned him the attention of the secret police.Horák died in 1997. The Cesky Terrier is patient, playful, sporty yet calm. A sweet and joyful dog that is good with children, it is brave, loyal, obedient and courageous. Intelligent, very trainable and easy to handle, it is important to socialize them while they are puppies, letting them meet with various people and different animals in positive circumstances to experience a variety of situations. This will help them be well adjusted so they can grow up to be happy adults. They love people, especially children and are fairly friendly with strangers, but like most terriers, if you are not 100% pack leader, they can be feisty, stubborn and fearless. This sociable dog gets along well with other dogs and with other household animals. The Cesky travels well. It is an excellent companion dog that is capable of playing with children, yet at the same time being an attentive and threatening house guard. Make sure you are this dog's firm, confident, consistent pack leader to avoid Small Dog Syndrome, human induced behavior problems. Always remember, dogs are canines, not humans. Be sure to meet their natural instinct as animals. This dog breed has a life span of 12 to 15 years with general good health. 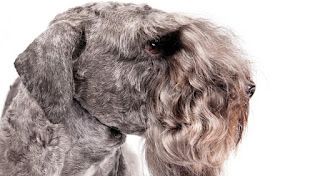 The only known common health condition in Cesky Terriers is Scottie Cramp, which causes the dog to have locomotive problems due to a lack of serotonin in the body. This disease is not life threatening. 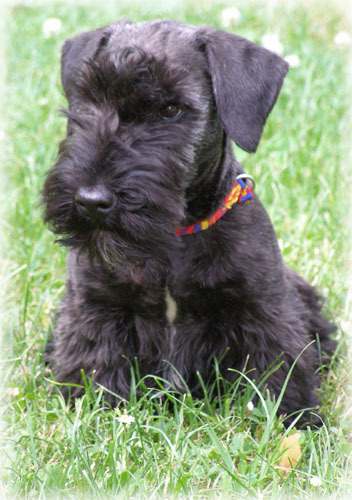 The Cesky Terrier requires an average amount of exercise such as a long walk per day. Although this breed, like other terriers, enjoys digging and open space outside, the Cesky Terrier can make a good apartment dog as well. Due to the longer coat, the Cesky Terrier requires grooming and hair clippings monthly. Originally bred as hunting dogs, Cesky Terriers are highly intelligent and extremely obedient, making them fairly easy to train. However, like most terrier breeds, they can be willful and stubborn when not given strong leadership. Therefore it is important to maintain a calm and assertive authority when handling this dog. The Cesky is an active breed that needs daily exercise to stay physically and mentally well-tuned. 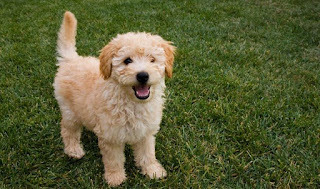 It does not do well living exclusively outdoors or spending most of its time in a kennel or crate away from its people. This is a breed that can thrive in large homes as well as in homes where space is limited, as long as there is regular play and exercise time. A securely fenced yard where the Cesky can stretch its legs and run freely is great for this breed, as are daily walks at the park or around the neighborhood. Ceskys can be sensitive to outdoor conditions and do not enjoy being in extreme temperatures or weather, preferring to stay warm and dry inside. Although it gravitates to a leisurely lifestyle, the Cesky still loves to, and needs to, get regular playtime. It is always ready for a game of fetch with its owner - or anyone else, for that matter. This is not a breed for people who don’t have time to spend with their dog. 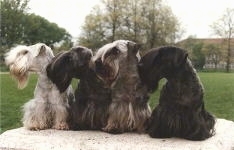 Cesky Terriers crave attention and above all want to be with their family. The Cesky is a coated breed, so don’t get one if you’re not willing to put in time for grooming. Cesky puppies need daily grooming, and adults must be brushed once or twice a week. To maintain its appearance, the coat must be trimmed every four to six weeks. You’ll also want to clean your dog's beard after he eats or drinks. You can have him groomed professionally or learn to do it yourself. The rest is basic care. Trim the nails as needed, usually once a month. Brush the teeth frequently for good overall health and fresh breath. Check the ears weekly for dirt, redness, or a bad odor that can indicate an infection. If the ears look dirty, wipe them out with a cotton ball dampened with a gentle ear cleaner recommended by your veterinarian. 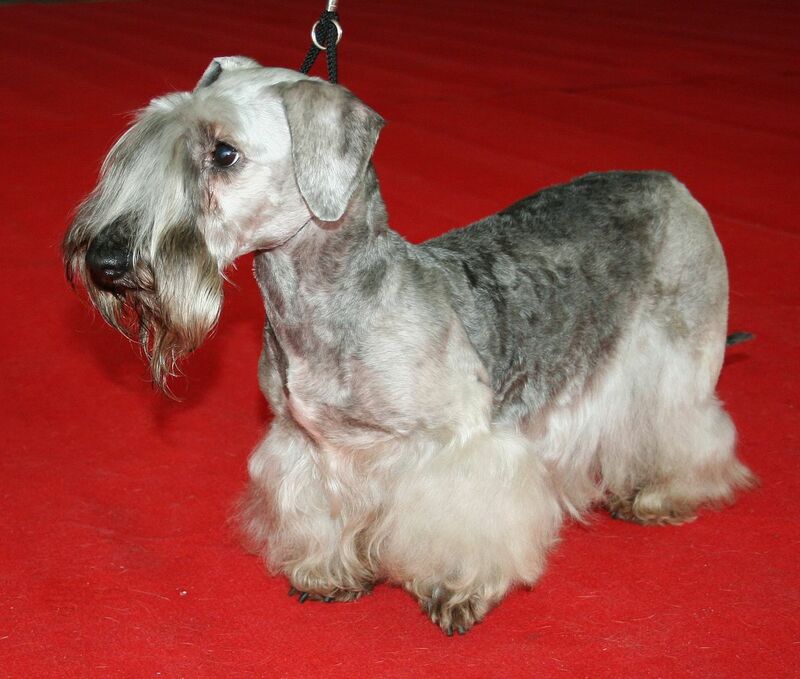 Is the Cesky Terrier the Right Breed for you? Difficult Training: The Cesky Terrier isn't deal for a first time dog owner. Patience and perseverance are required to adequately train it. The Cesky Terrier is one of those breeds developed to work a certain type of terrain: in his case, the forests of Bohemia. The Cesky’s quarry ranges from duck and pheasant to fox, rabbit, and wild boar.